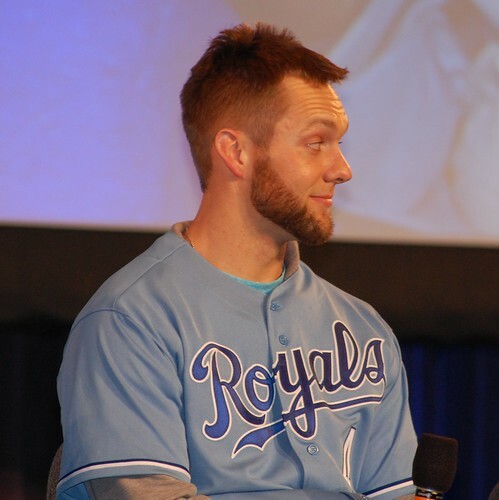 Remember this Alex Gordon beard? Yeah, sorry, you had repressed it, hadn't you? Let’s see if I can come up with a post every day of the rest of the offseason. Today, there are 23 days left until Opening Day on April 6.
is the number of home runs Alex Gordon hit last year. That led the Royals. Wilmington, disappointingly, did not have any 23-homer-hitters. John Whittleman only hit 20 for the team lead there, and nobody in the lower leagues hit anywhere near that many. Of course, Salvador* Perez’s total could be different, depending on how much time he misses with his torn meniscus. *how the heck did “Salvy” start making it in to the papers? And yet they still keep referring to Manuel Pina as “Manny,” despite the player’s own request for that to stop. I will not use “Salvy” unless Salvador himself confirms that’s what he wants to be called. The team’s total last season was 129. If all the regulars hit roughly what they’re projected to, that will put them at 121ish, plus a few from the bench. Of all the things that the 2012 team is going to be – exciting, hyped, energetic, important, and eventually disappointing – one thing they will not be is circling the bases too frequently.